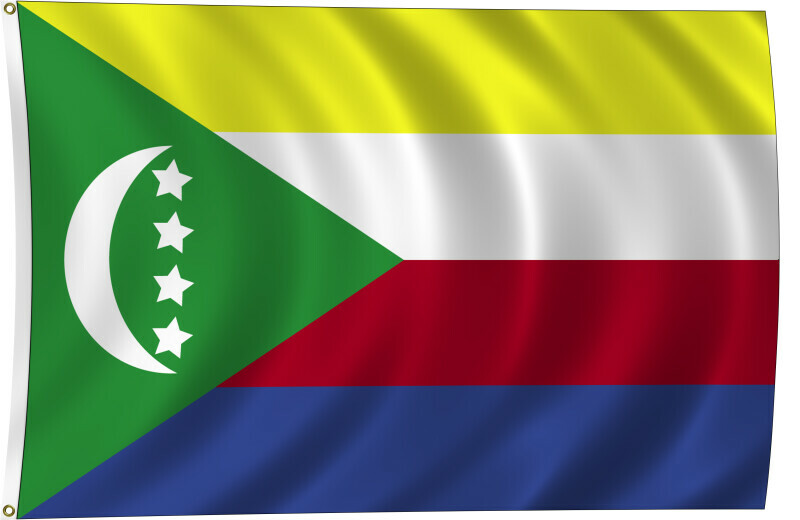 Color flag of Comoros. Four equal horizontal bands of yellow (top), white, red, and blue, with a green isosceles triangle based on the hoist; centered within the triangle is a white crescent with the convex side facing the hoist and four white, five-pointed stars placed vertically in a line between the points of the crescent; the horizontal bands and the four stars represent the four main islands of the archipelago - Mwali, N'gazidja, Nzwani, and Mahore (Mayotte - territorial collectivity of France, but claimed by Comoros). Flat color and black/white versions of world flags are available on the Clipart ETC website. WARNING: You are about to download a 1.9 MB TIFF!